We are the suppliers and manufacturer of a wide range of Wooden Bookends, antique, elegant and beautiful Bookends. We supply our range of product in various countries. The product is made up of high quality of metals and wood. The polishing and finishing of the product is of superior quality. We offer a wide range of Wooden Bookends With Timer in different shapes and sizes as per the requirements of our customer. The elegancy of this bookend lies on its classy design. 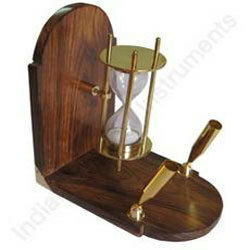 The ancient sand timer attached on it gives more beautiful look. The product could be use in office and home as well. We provide the product at genuine prices. The product code for the item is 2684. We supply the Children's Bookends made from superior quality of wood and metals, in varied shapes and sizes as per customer’s specifications. The product is made up of our team’s hard work and efforts to give it an antique finish which make the living area more appealing. The beauty of product is more enhanced with the compass and pen holders mounted on it. The product code for the item is 2685. We provide our customer a wide range of Handmade Bookends blended with functionality and beauty. The exclusive design and flawless finishing of our product makes them ideal to give support the books on table. The sailing wheel mounted on it makes it more attractive. Our customer can avail the product with the product code 2886. We offer a comprehensive range of Wood Bookends made up of high quality of wood and perfect finished metals. The use of the product is for home décor and offices as well. The aesthetic design of product gives an elegancy to the room when kept in. The anchor lying on the centre of Bookends makes it more captivate. The pen holders attached on it gives more elegancy to the product. The product code is 2687. We are the supplier and manufacturer of varied range of Antique Bookends with elegant looks and design. The product is available in different shapes and sizes as per requirement of customer. The antique finish of products makes the living area more appealing. The metallic globe mounted on the centre of Bookends more beautifies the product. Our customer can avail the product by mentioning the code 2682. We offer our customer a wide range of Decorative Bookends manufactured from the wood and metals of superior quality. The product varies in different sizes and shapes, which is available at very reasonable prices. The Bookend is exclusively designed for our valuable customer, which make their living more charming and elegant. The product code for the item is 2690.